The practitioners of the modern architectural establishment are on the march again. Like matron, they are determined to force another dose of utilitarianism down our throats. 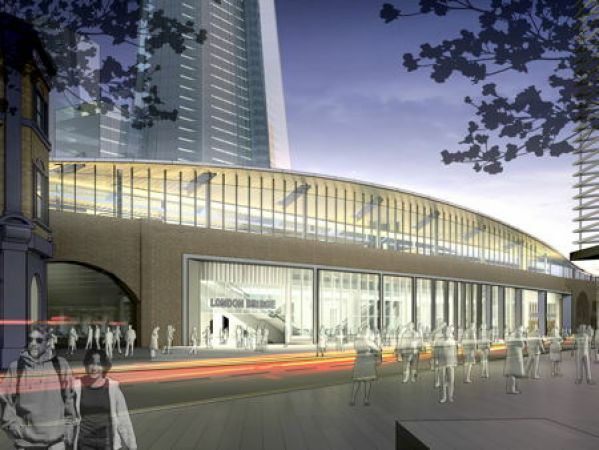 Last week I had my first sight of Network Rail’s plans for the ‘rebirth’ of London Bridge station, next to the controversial Shard building. Anyone interested in railway heritage will have concerns about the amount of demolition involved and the quality of the rebuilding. In order to realign the platforms, which is an essential part of the Thameslink redevelopment, Network Rail and their architects, Grimshaw, have obtained permission from English Heritage to dismantle and destroy the listed trainshed which covers the existing low-level platforms. Built by Charles Henry Driver for the London and Brighton Railway Company in 1864, it was a grand architectural statement to celebrate the company’s arrival in the capital. It will not be replaced. In the face of fierce opposition from the Victorian Society, Network Rail are also seeking permission to demolish the South Eastern Railway buildings at 64-84 Tooley Street, designed by Charles Barry Junior, which they claim will be in the way. On the site they propose to create what they call a Public Realm, an open space where passengers can congregate in safety rather than milling around on the narrow pavements of Tooley Street, trapped in the London Dungeon queues, as now. At the rear of this so-called Public Realm is the entrance to the new station concourse, which will be under the arches at ground level. In the artist’s impression, the entrance to the station appears to be a bleak horizontal concrete slab. I have a question for Network Rail: you want to take down the buildings at 64-84 Tooley Street in order to create a Public Realm. Is this just an open space, or will there be any architecture here to replace the lost buildings? The truth is that, apart from the listed Shipwright’s Arms on the left, there will be no architecture and there will be no grand entrance. Passengers entering the station from Tooley Street will be driven in through a drab letterbox. They call it a colonnade, but it has no arches and no columns worthy of the name. Although the existing arches to the left and right will be cleaned and restored, the entrance itself is just a gaping hole with a straight lintel. The opening is said to be the same size as the Big Ben clock tower lying on its side, but there the similarity ends. This is essentially just a gash, devoid of architectural merit. Above will be the brickwork of the viaduct and the new platform canopies. Inside, Network Rail will have replaced the present arches with an open space supported on ugly concrete ellipses. On the other side of the station, in St Thomas Street, a much better entrance has been devised with new brick walls and arches. A similar treatment would have worked well on Tooley Street, where it would have harmonized with the existing arches to the left and right of the entrance and could have introduced a much-needed element of grandeur. Instead, perhaps influenced by the undistinguished modern buildings which have recently intruded on this historic quarter of London, the architects have slumped back into the typecast utilitarianism which is damaging so much of our urban landscape. The fundamental problem with the Tooley Street entrance is its brutal horizontal lintel. The horizontal is a poor concept, demeaning to the human spirit. We understand that with steel, concrete and glass, it is easy, even natural, to go horizontal. However, it is no longer good enough to accept that form follows function. The dominance of the massive horizontal, like Cubism, is a thing of the past. The most nihilistic concepts of the Modern Movement should be abandoned. We need an architecture that speaks to the human spirit. Mixing rectangles with arches, as proposed here, is a crude mismatch. It should be obvious to anyone with a sense of design that there is a conflict between the arches at the sides and the sawn-off section in the middle. This is not architecture. It is the absence of architecture. We are being offered destruction without benefits. We are not utilitarian beings, and we do not thrive on utilitarian engineering solutions. We will find Network Rail’s new London Bridge more convenient, but we will not be uplifted by it. And we will regret what has been lost. Another sad thing about the plans at London Bridge is the absence of a trainshed. In the reborn station the platforms will have long, snaking canopies – a sort of stripped-down version of Clapham Junction – but the tracks will not be covered, there will be no new trainshed, no big architectural statement, no grandeur or excitement worthy of a great London terminus. No use will be found for the dismantled trainshed. It could, perhaps, have been re-erected over the so-called Public Realm on Tooley Street. Instead, there is to be just an open space, sadly forgetful of the buildings that were there. Unlike Paddington, St Pancras, King’s Cross, Liverpool Street, Victoria or Waterloo, the new London Bridge will be a place without presence. It will be more functional than now, yes, but it will represent the triumph of the anodyne. Fifty or a hundred years from now, will people see London Bridge as a landmark of 21st-century architecture? For glimpses of what is proposed, please click here. As a society, we are suffering a failure of the imagination, and the plans for London Bridge are an example of our spiritual and artistic malaise. Instead of rivalling or surpassing what was there before, we seem content to tinker and diminish, demolish and dishonour. Utilitarianism on its own is not enough. Where a grand architectural statement is required, respectful of its historic surroundings, we seem to think that nothing more than the functional is merited. Are we a tribe of transport consumers or are we living, thinking, feeling beings? Too many transport architects and engineers appear to believe all that matters is passenger flow. Passenger flow does matter. The existing routes to and from the platforms are ramshackle. When the new lifts and escalators have been installed, we will be whisked up to the trains with effortless efficiency. But will we be inspired? The Driver trainshed unfortunately cannot be retained with the new platform layout, but it could have been emulated. We could have had a grand new terminus. Instead they have given us a series of snakes, a letterbox and a toothless grin.